2-12 –Demolecularisation Be A Hero! 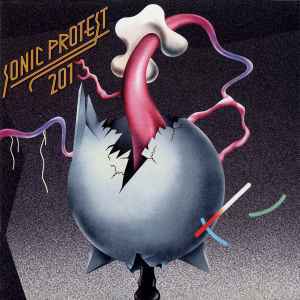 Compilation issued with Sonic Protest Festival 2013. Comes in a 7" cover. 1-2 : Recorded live at Les Instants Chavirés 28th january 2013. 1-3 : Published by EMI Music Publishing (P) & (C) 2012 Bureau B. LC13875. ISRC DEL151200857. 1-4 : Edited and dubbed at Teck Chai Far Eastern Music and Bicyle Repair Co. Pte Ltd with material taken from the Mecanation live concerts on the 23rd and 24th of Nov 2012 in Singapore. 1-5 : Recorded in january 2013 in Saenveng village, Tadlo waterfalls, Saravan, Laos. 1-11 : Recorded 28th february 2013 at Le Consortium, Dijon. Distances Ouïes-Dites has been commissioned by Why Note to Jean-Luc Guionnet for the Ensemble Dedalus. 2-3 : Demo, to be released in september 2013. 2-7 : From the album "Mwoahh", recorded april 2012 in Haaksbergen. 2-10 : Recorded In Yunnan China, december 2011. 2-14 : Live at LEAP Berlin - extract 2013. 2-16 : Recorded in Yunnan Dali 2011. 2-17 : Taken from the album <a href="http://www.discogs.com/Les-Reines-Prochaines-Le-Coeur-En-Beurre-Doublegras/release/1833942">Le Coeur En Beurre - Doublegras</a>.